Create your DataKeeper volumes and your cluster. See Creating a DataKeeper Volume Resource in WSFC for reference. *IMPORTANT: The iSCSI Target Role only supports DataKeeper Volumes that are mirrors of Simple Volumes placed on Basic Disks. If any of your mirrors are using volumes such as Striped or Spanned volumes on a Dynamic Disk on either the source or target system, then you cannot create an iSCSI Target role that uses those DataKeeper Volume resources for storage. From the Windows Failover Cluster Manager UI (cluadmin.msc), select Configure Role and navigate to the screen to select the iSCSI target role. 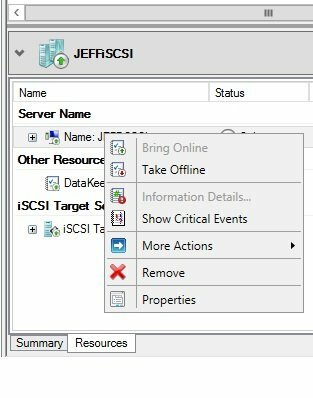 Select iSCSI Target Server role and select Next. The Client Access Point page appears. Type the Client Access Point name and IP address for the iSCSI Target Server instance. *IMPORTANT: This name and IP address will be used later by clients to access the server address, so it should be recorded in DNS. This is very important for the servers to be able to resolve these names. 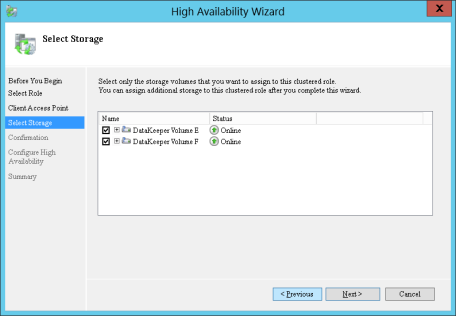 On the Select Storage dialog, select your DataKeeper volume(s). With the next set of screens, you should be able to complete the configuration. 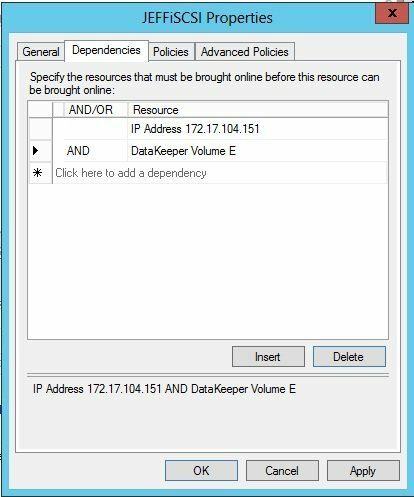 Following setup, from the Failover Cluster UI, add dependencies for the DataKeeper volume(s). a. Click on Roles in the left pane, then click on the iSCSI Target Server resource in the top center pane. b. In the lower center pane, select the Resources tab, then right-click on the Name: <client access point name> under the Server Name heading and select Properties. c. Select the Dependencies tab and add the appropriate DataKeeper volume(s) as dependencies. Setup is complete. Proceed to the iSCSI Virtual Disks configuration.